The spacious terrace which extends to its own garden has spectacular views overlooking the 16th and 17th holes, a large lake and the mountains. The terrace patio has been extended and is fully furnished to a very high standard with comfortable sofas, coffee table and dining table with chairs. It is a perfect location for alfresco dining and barbecues (barbecue provided). This apartment is the best on the resort for size and location. WC bathroom with shower over bath, separate bidet, luxury sink and heated towel rail. Towels provided. internal telephone which is free when using to call within the resort. not pool or beach towels. Both indoor and outdoor to seat 4. Overlooks the gardens and golf course. Notes on accommodation: No pets. Outside: Large extended terrace fully furnished with high quality comfortable and stylish furniture. Terrace leads out to your own garden which in turn looks out over the golf course with mountain and lake views. A large shared pool is located just 40 meters from the garden. BBQ provided. Utility Room: Washing machine. Cleaning / Towels / Linen / Maid service: Towels and linen provided. The apartment has a full clean at the end of each stay and can have a mid stay clean upon request. Glad you liked it and found a property of your own. Look forward to welcoming you back this weekend to complete the purchase. Exciting times! You have bought in a fantastic part of Spain. 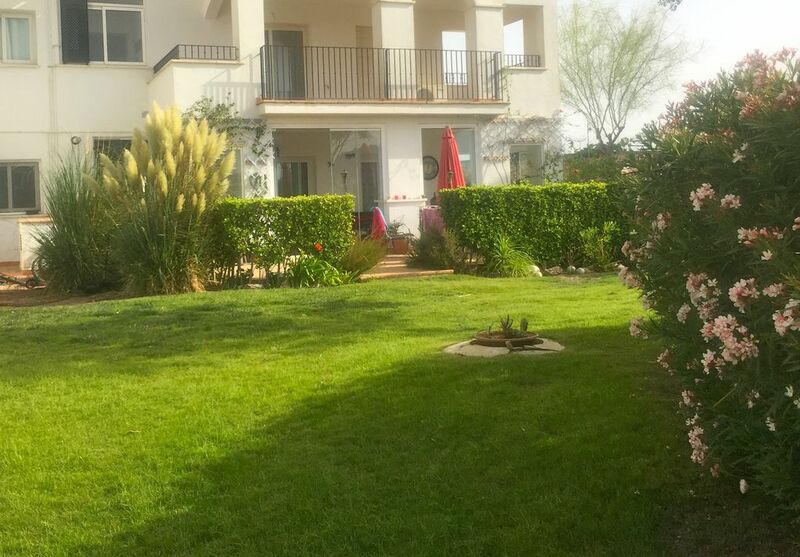 We felt very secure in the complex and the apartment is well placed close to the pool and with lovely views across the golf course. So glad you and your family enjoyed it so much and wish to return next year. I thought it would be perfect for you with the pool being very close by but not right on top. That way its safe for your children as they need to open the gate to get to the pool area. Look forward to welcoming you back soon! Hi Linda and Aidan, Thanks for being such good clients and I really look forward to welcoming you back next year on sooner! Perfect situation on the 17th tee, tranquil spot but also near to the pool. This resort is beautifully maintained and the apartment is in a peaceful setting right on the 17th tee. We particularly enjoyed the glassed area (perfect for morning coffee and a sun-downer in the evening!) and the large terrace was great as it was largely shaded in the heat of the day and then benefitted from the evening sun. There is a grassed area in front of the apartment where we could either enjoy the sun or find some shade later in the afternoons. The kitchen was equiped sufficiently for our simple cooking needs (pizza,Spanish omelette, pasta and salad etc). Bathroom clean and functional with a great shower! Would definitely stay here again. Spencer (the owner) has always been quick to respond to any questions we had, and I believe is keen ensure his guests enjoy a great stay. Thank you! Hi Kitty, I very much enjoyed renting to you. Great communication. Really glad you would like to return. Remember to book early to secure dates as I take most of my summer bookings just after christmas. We stayed here from Boxing Day through until 6th Jan, the apartment was immaculate upon arrival, and everything it had to offer all worked and the free Wifi was terrific. The pool was amazing and very close to the apartment, as was the club house bar and restraunts. We found the apartment to be a fantastic base for visiting the different beaches of Los Alcazares, La Zenia, and Cabo Roig which are between 15 and 20 minutes away. We would highley recommend staying at this property. Sounds like you thoroughly enjoyed it. That’s great! I am sure the constant sunshine helped also. I look forward to your return one day. The apartment was nicely furnished and very clean. It has everyone you need to enjoy your break even a small supply of your essentials like tea/coffee & sugar! You will need the heating in the winter months as it’s not directly south facing but I do think this would be an advantage in the summer months to escape the intense heat. Would definitely recommend. Great guests. Easy communication. No problems at all. Julie I hope you found you dream holiday home while you were here. I hope to see you in the bar someday! The Mar Menor has 18km of sandy beaches ideal for families as the water is calm, shallow and warm throughout the year. Perfect for participating in the many water sports on offer. Walking is popular along the beach promenades. There are plenty of cafes, tapas bars, palm trees and restaurants found along the beachfront. San Javier Airport 10 minutes drive. Alicante Airport 55 minutes drive. Train station-Balsicas station is 10 minutes away - (Riquelme station directly outside the resort is due to open very soon). These provide links to anywhere in Spain. Less than 1km to the quaint village of Sucina. Nearest beaches 10 minutes drive. Murcia city 20 minutes drive. Cartagena city 25 minutes drive. A day trip to Murcia City, (by local train or about 15 minutes drive) to visit some of the stunning historical places of interest, art and culture is a must. Likewise a visit to the ancient seaport of Cartegena, (local train or 20 minute drive) to stroll along the harbour and see ancient ruins is a wonderful family day out. Both these stunning city's are in easy reach by local train. The New Water park (Terra Aqua Murcia) and Animal park (Terra Natura Murcia) are just 20 minutes away. This is a fantastic day out for all the family and you have the opportunity to swim with Sea Lions. The region of the Costa Calida is blessed with a fantastic Mediterranean climate averaging 21c boasting around 320 days of sunshine per year, making this a prime location for golf in every season. The region is of course becoming more and more famous for its fabulous array of golf courses, and is now world renowned for its Jack Nicklaus Golf Trail, of which the Hacienda Riquelme Golf Resort plays an integral part. There are some beautiful walks in the mountains and the local national parks. Hiking and bike riding is very popular in this area. Horse riding is available from the stables in the resort next to the Hacienda and has a very authentic Spanish cafe/restaurant with beautiful views. Booking Notes: There is a £60 cleaning fee to be paid locally on departure for every reservation . There is a £100 refundable damage deposit to be paid before arrival which is returned 7 days after your holiday. Changeover Day: Days and times flexible dependant upon other bookings. Notes on prices: School holidays are charged at a minimum £250 per week. All bookings are subject to a £60 cleaning fee Long term lets available. Please contact owner with request.